We have recently launched a short course entitled, “Cycling Science: the essentials of cycling physiology and coaching”. For further information about the course, please click HERE. In this article we are covering content from the eighth module of this short course. The complete module covers the principles and theory of load monitoring, detail on how to complete a submaximal modified LSCT test, as well as information on how to set up a monitoring template (with the template included), for you to be able to monitor your own training load. In this article we will discuss measuring training load and monitoring longitudinal training load through the means of a performance management chart. It is important to note that training load may be monitored using rating of perceived exertion (RPE), Heart rate or power. RPE and heart rate are internal load metrics, whereas power, and it’s derivatives, are considered external load metrics. Although power based load metrics have become widely popular. There is no peer-reviewed evidence to suggest that power based longitudinal load monitoring is any more effective than either HR or RPE based methods. However, in this article we will limit our discussions to the use of power based longitudinal load monitoring. Within our short course material we include a monitoring template to be able to conduct monitoring, as discussed here, but by simply using RPE. Normalised power (NP), Intensity factor (IF) and The Training Stress Score (TSS) are all registered trademarks of Peaksware training systems, and terms originally developed by Dr. Andy Coggan and Hunter Allan (Allan and Coggan, 2010). Your normalised power (NP) is a weighted average power which was developed to represent the physiological cost equal to the particular session or effort. Therefore if your NP was 300 Watts for a training session or effort, it implies that the session or effort was equivalent to maintaining the same constant power (300 watts) for the same duration. When riding at varied power, as is typical during a mountain bike or road ride on hilly terrain, your average power would be much lower than your normalised power, and therefore using normalised power when power is extremely stochastic, is a better gauge of effort. Your intensity factor (IF) is simply your NP divided by your FTP. As previously discussed, your FTP is your functional threshold power and roughly equal to a power you are able to sustain for a prolonged period of time (30 – 90 minutes). 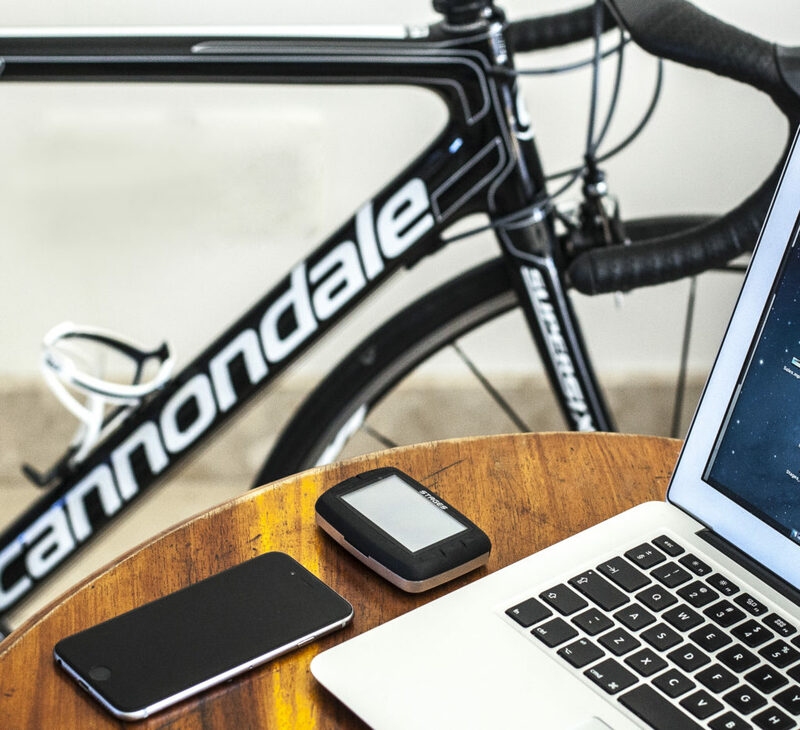 As highlighted in previous modules, your FTP is best determined through physiological testing. Your training stress score (TSS) is a measure of individual session training load. It is calculated using the individual’s relative intensity, and duration of training session. It may represent the training load of any endurance sport and may be calculated from power, heart rate or rate of perceived exertion (RPE). However, it most commonly used to describe the training load of a training session performed with a power meter. 2. Monitoring longitudinal training load. Again the primary variables discussed in this section; Acute training load (ATL), Chronic training load (CTL) and training stress balance (TSB) are registered trademarks of Peaksware (TrainingPeaks) training systems. The ATL is your short term training load, normally during the last 7 days, whereas your CTL is your longer term training load, normally the last 42 days. TSB is simply the difference between your CTL and your ATL. Crudely, we like referring to your ATL as your current fatigue state, your CTL as your current level of fitness, and your TSB as your current level of freshness. A performance management chart is a longitudinal graph showing CTL, ATL and TSB over a selected period of time. As shown in the figure below, the blue line (CTL) may be visualised as your fitness. The pink line as you fatigue, and the yellow line (TSB) your freshness or readiness to perform. Athletes and coaches often make the mistake of over interpreting this model as direct measures of the simplified terms they are defined as; fitness, fatigue and freshness. In reality, performance is extremely complex and there is currently no model, which may account for all possible factors contributing to human variance. There is no doubt that athletes with relatively low cardiovascular fitness levels will improve their performance as CTL is increased. The problem lies in that there is no direct means of determining the correct CTL for an athlete without prior training history and training data. Optimal CTL values may vary from 70 TSS/day, for some competitive age group athletes, to as high as 140 CTL for pro tour riders. The best way to establish your optimal load is simply by continued performance monitoring. As you increase your CTL, ensure that performance continues to increase. If your performance is stagnating, or even decreasing, this may be a sign that you have surpassed your optimal CTL range. It is critically important that you monitor adherence to your periodised training plan. 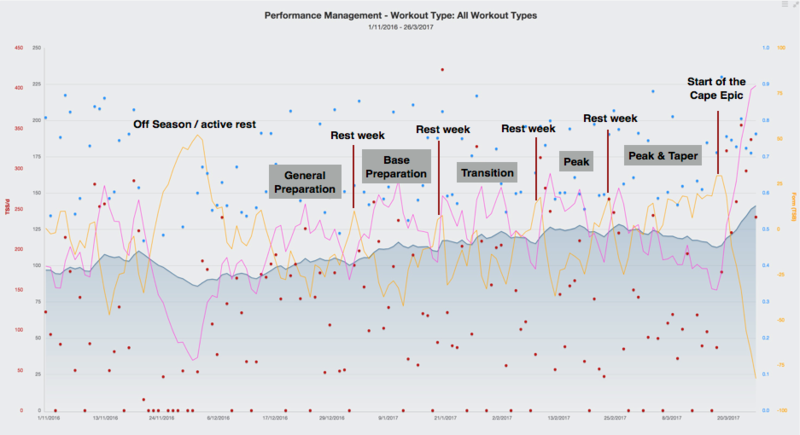 Here is an example of an athlete preparing for the ABSA Cape Epic, Throughout the process training load was very closely monitored to ensure that the intended training load was correctly applied, and importantly that the objective of each rest week was achieved. When evaluating your periodisation plan, ensure that each block or phase or training results in adequate stress. This can be seen as the ATL being greater CTL. This can be seen as the periods where the pink line is above the blue line. Very importantly, between your blocks of training is when the athlete becomes “fresh”. Ensure that their training stress balance, or TSB, which is the yellow line spikes into positive values. To conclude, training load monitoring is extremely important, but it is important that its value is understood. Training should never be prescribed with the sole purpose of achieving load goals. Correct basic physiology principles should always be followed to ensure that the correct systems are being stressed to ensure the required physiological adaptation. Once the most correct physiological principles are followed, there is certainly value in monitoring your load metrics, which may assist the athlete to achieve optimal performance gains from their training and ensure optimal tapering strategies. Allen, H. Coggan A. Training and Racing With A Powermeter. 2nd Edition. Velopress. 2010. Murray, NB. Gabbett, TJ. Townshend, AD. Blanch P. Calculating acute:chronic workload ratios using exponentially weighted moving averages provides a more sensitive indicator of injury likelihood than rolling averages. BR J Sports Med. 2017. 51(9): 749-754.